You may ask why do we need natural ayurvedic remedies for scabies when there are a lot of creams prescribed to us by doctors. First, let us know what scabies is. Scabies is an extremely itchy skin problem caused by a very small mite that gets inside the skin and lays its eggs under it. The itchiness is caused because of the allergic reaction to the mite presence. The first symptom of scabies are small bumps that itch and are usually found near the inner sides of the wrists and even in the skin between the toes and fingers. 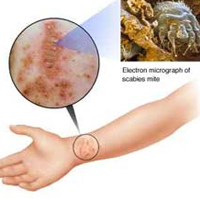 If you have scabies then you will notice thin lines on the skin caused because of the mite passing under the skin. Scabies is a transmittable skin condition and it can be passed from one person to another by skin contact. Scabies is more commonly observed in small children who pass it on to other children of their own age while playing. Simple act of holding hands can pass scabies from one to another. In adults, sexual activity may also transmit scabies from one to another. Scratching on the affected area causes skin to open and further aggravate the situation by causing further bacterial infection or other skin problems. One can also get scabies from a dog that has scabies. In dogs, this skin condition is known as mange. If you feel that your pets has scabies then seek medical help by taking your pet to a vet to get it treated as well as to avoid spread of this problem to people in the home. You will not get scabies from cats with mange, feline mange is not transmittable. If small children have scabies then first you must consult a doctor for proper diagnosis. A doctor will generally prescribe a medicated cream to kill the mites in the skin. This cream is required to be applied on the affected parts as well as other parts as per doctor’s direction. This cream is harsh and can cause problem in those who have sensitive skin or skin condition like eczema. The skin of small children is sensitive and the cream may be harsh for them. This is one of the reasons why we need natural ayurvedic remedies for scabies. The itching will continue for few days even after all the mites may have been killed as the bodies and waste of mites may still remain inside the skin. As the mites are reduced in number the appearance of thin lines under the skin will be reduced and the itchy bumps will go down. 1. Make a paste of neem oil along with turmeric powder and apply on the affected area. These natural ayurvedic remedies for scabies help in reducing the mites and reducing the itch. Nowadays you can also buy creams and lotions made with neem oil for the treatment of scabies. 2. Tea tree oil is also one of the effective natural ayurvedic remedies for scabies. Do not use tea tree oil without mixing with a base oil first as it may be harsh. You can also buy creams and lotions with tea tree oil in it to treat scabies. 3. You can also add essential tea tree oil to your bath water. Add ten to twenty drops in a bath water about two times in a day. Someone who has come in recent contact with another person with scabies can also take these natural ayurvedic remedies for scabies to avoid it. 4. A lotion with chamomile extracts in it is also one of the natural ayurvedic remedies for scabies used by many. It will help reduce the itching caused by scabies. 5. Another one of the natural ayurvedic remedies for scabies is to use an antibacterial wash and lotion to the area that has been scratched to avoid any bacterial infection.